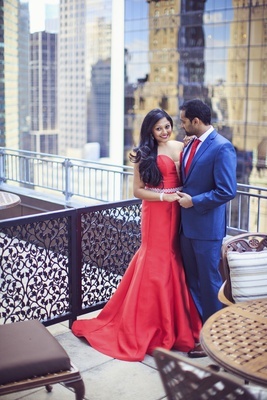 Because their parents were close friends, Shilpa and Shravan Reddy essentially grew up together, as they went from middle school to medical students, all the while falling in love through the art of conversation due to their faraway hometowns. 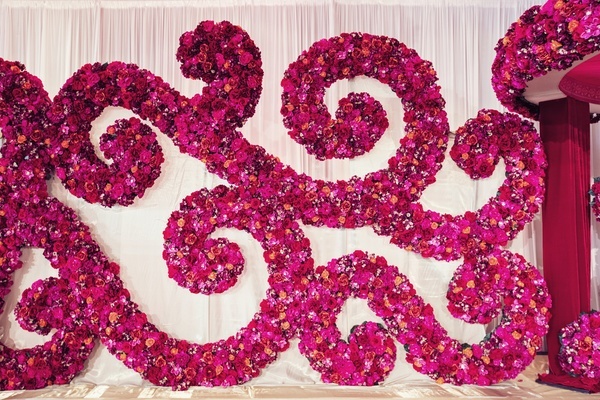 After knowing each other for over a decade, Shravan decorated the backyard of his beloved with candles, flowers, and photos of the couple. 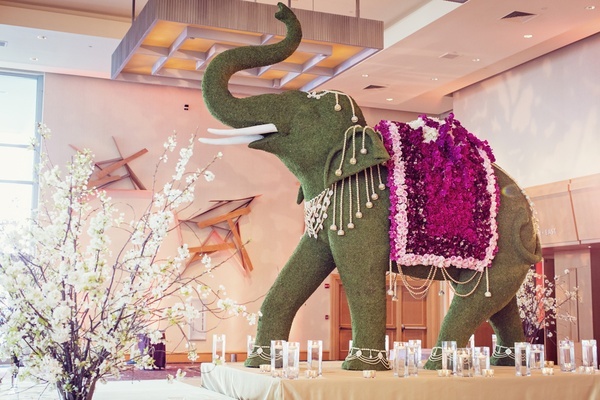 Shilpa’s favorite chocolates and Champagne were also on hand, as well as the duo’s closest friends – sporting customized shirts that spelled out “Will you marry me, Shilpa?” As Shravan got down on one knee, their friends ran into the backyard and lined up to proclaim the message. 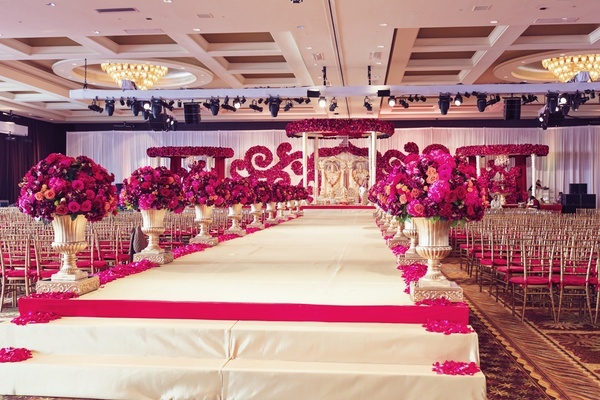 “We wanted a wedding someplace warm and near the water, but not too far from our homes in New York and Michigan where the majority of our guests were flying in from,” the bride explains of the first major planning decision they made. 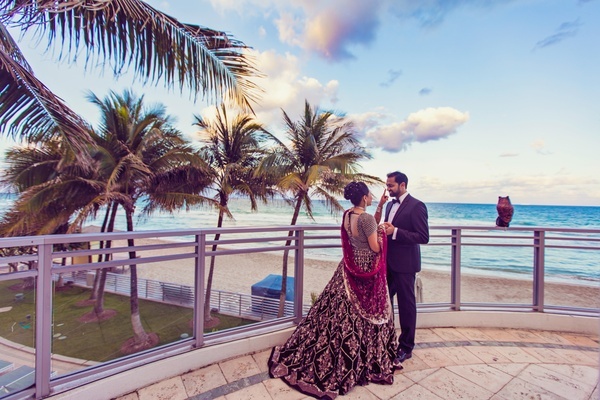 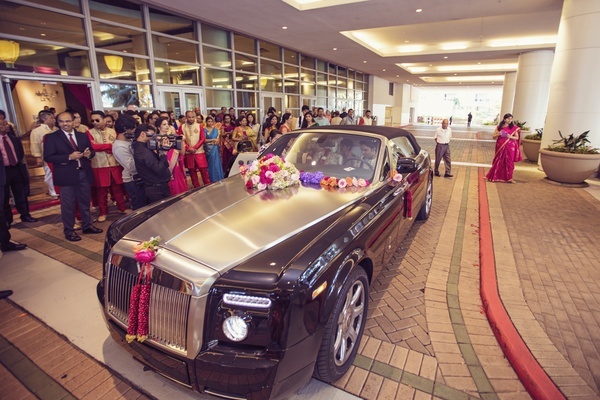 “Florida seemed like the perfect weekend escape for our guests.” As Shilpa and Shravan are both of South Indian descent, a traditional celebration that honored their heritage was of the utmost importance. 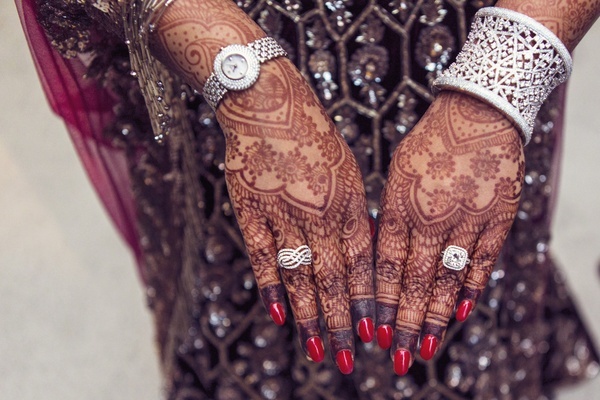 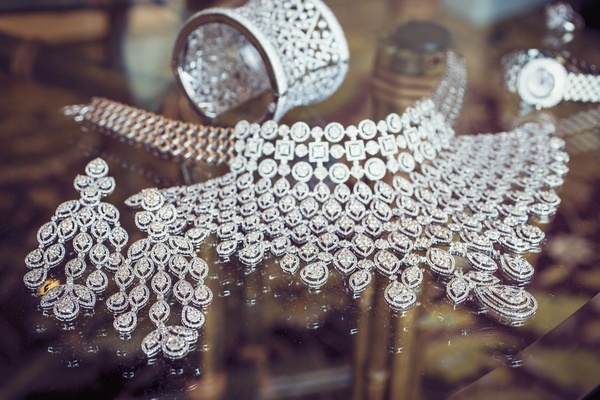 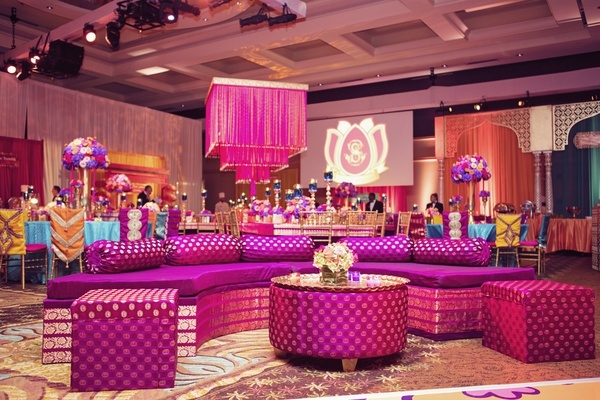 As such, the night before the wedding, they had a sangeet, which is a grand party held the night before a wedding – similar to a rehearsal dinner but with all your guests and a much more fun party atmosphere. 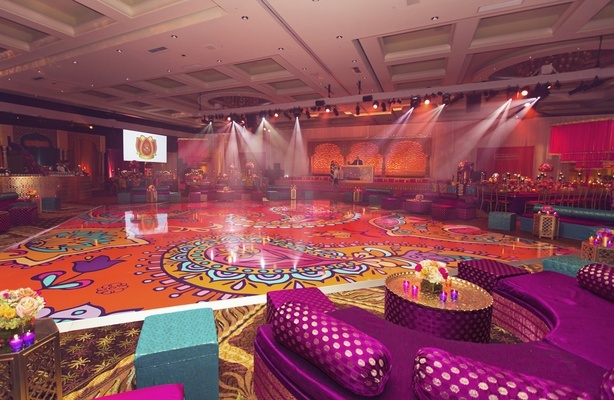 The décor for the sangeet was vibrant, with a patterned dance floor and fuchsia lounge furniture decorating the space. 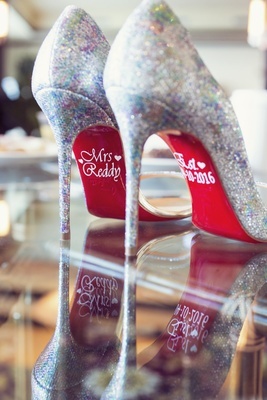 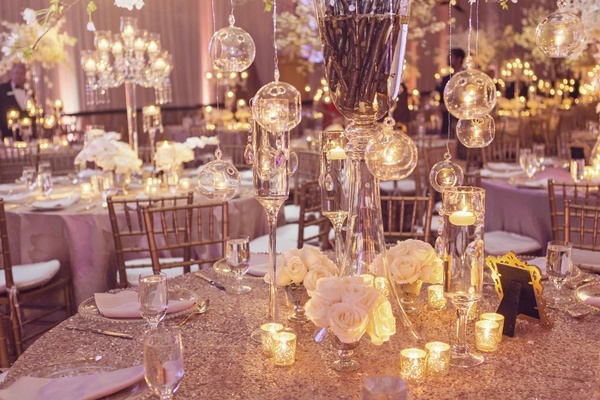 “We had Champagne divas in magnificent ball gowns greeting guests with glasses of bubbly, a nitrogen popcorn station, fortune tellers, and a full-body photo booth,” reveals the bride. 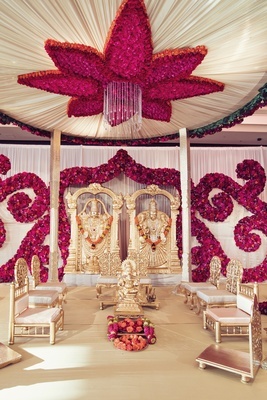 The next day, Shilpa walked down the elevated aisle with her brother, overjoyed to see her dad’s smiling face along with Shravan waiting for her. 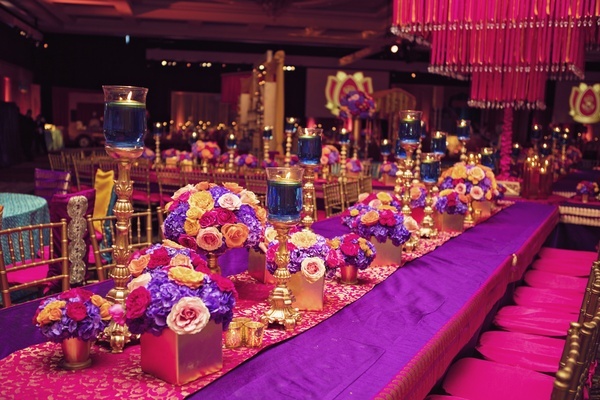 Bright fuchsia blossoms were arranged into an elaborate scroll pattern on the wall, but all eyes remained on the bride, who looked resplendent in her sari. 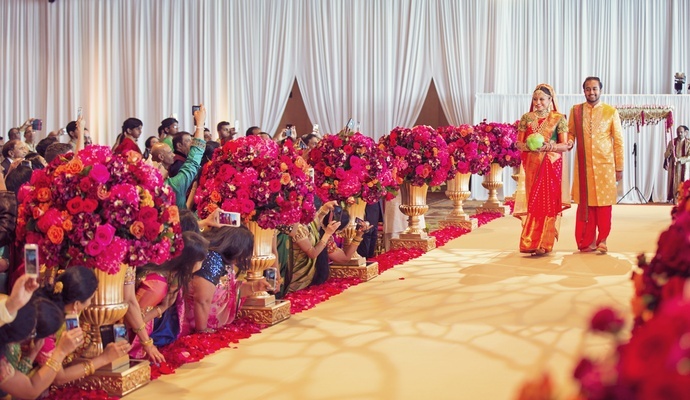 After the service, she and her new husband changed into Western wedding attire, though Shilpa’s gown was in red to still honor Indian culture. 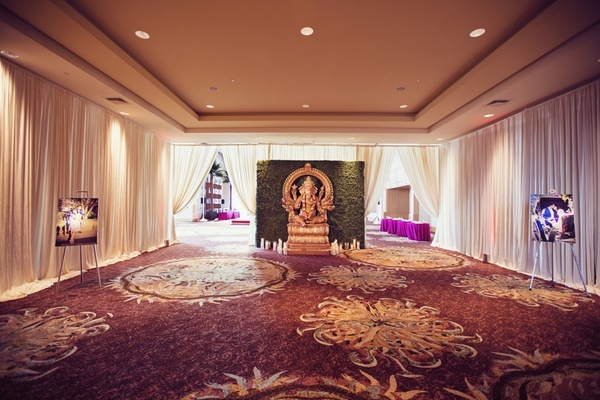 The reception featured a more muted color scheme with gold, shades of white, and the softest blush, but the room still made an impact. 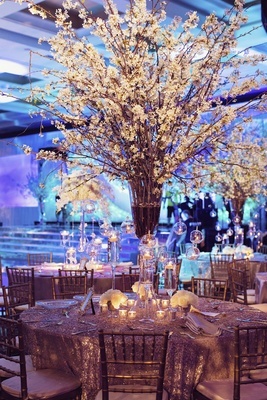 Towering centerpieces of cherry blossoms were embellished with arrangements of hydrangeas, roses, and additional assorted blooms. 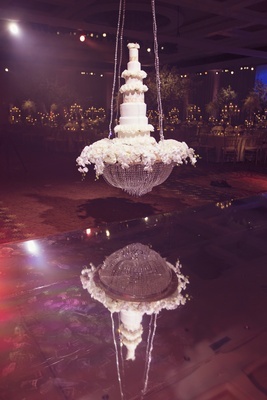 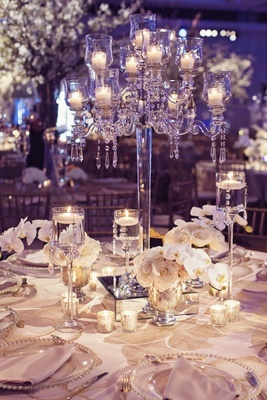 The extravagant cake was suspended from the ceiling, displayed on an opulent table made to resemble a crystal chandelier. 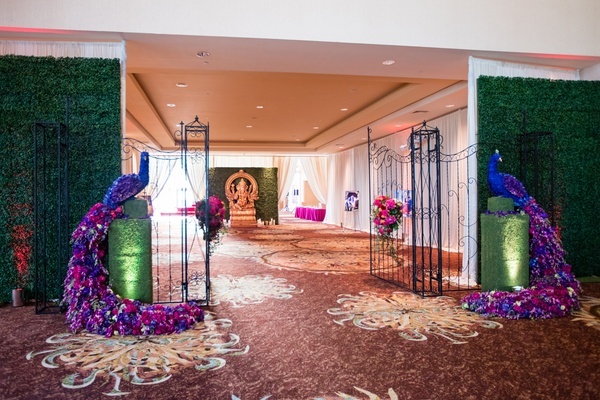 An a capella group, fire dancers, and fireworks entertained the revelers in addition to a night of dancing.